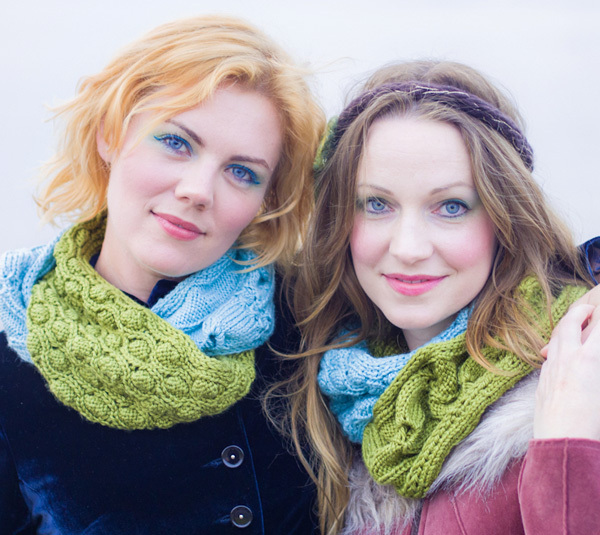 A few years ago Ysolda and Stephanie from Tiny Owl Knits teamed up with an idea for a partner project. 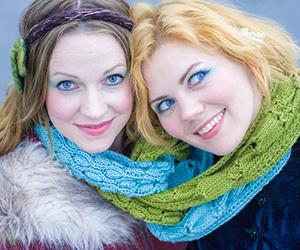 The concept was to create a knitted version of "best friend necklaces". Remember those? You kept one half, and your BFF kept the other? 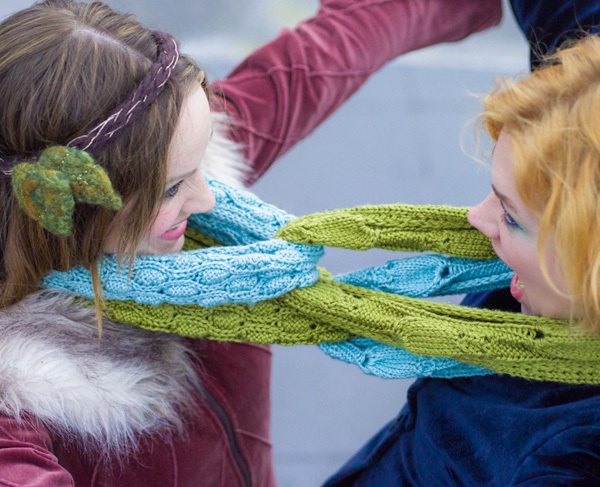 Introducing the BFF cowl! Interlocking links are knitted flat, then grafted together for all eternity. How it works: You knit both links [one of Ysolda's, one of Stephanie's] in your color, your friend knits them in a different color, then you swap one of the links and presto! You're best knitty friends forever. Oh, you should also be available for late night rants and movie sessions too. This project is perfect for swaps and for friends who've linked up across the globe because of knitting! Each link measures approx 6.5 inches wide and 26 inches in circumference. Each half of the cowl requires one skein. 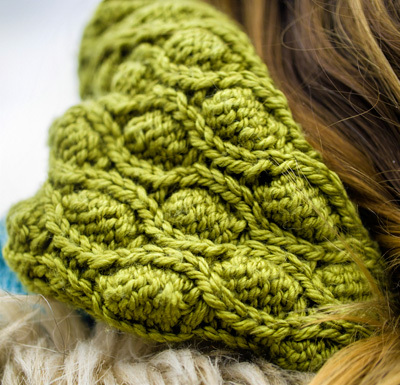 One cowl is made from two skeins. If you're making it all yourself, you'll need one skein of each color. If you're working with a friend, both knitters should choose a color they love, and make one of each of the two links in their chosen color. This project uses grafting. Instructions for this technique may be found here. 3 into 2 star: K3tog leaving sts on left needle, p3tog into same sts and drop from left needle. 3 into 3 star: K3tog leaving sts on left needle, yo, k3tog again into same sts and drop from left needle. 1 into 15: [K1, (yo, k1) 7 times] into same st, drop st from left needle. 15 sts created from 1.
m5: With tip of left needle pick up strand between st just worked and next st from front to back, and knit into the front loop; [k into the front, back and front of the next stitch], and with left needle tip pick up strand between st just worked and next st from front to back, k into this loop - 5 sts created from 1. Worked over a multiple of 8 sts + 3. Work from written or charted instructions as you prefer. Row 1 [WS]: K1, p1, [k1, p1, k5, p1] to last st, k1. Row 2 [RS]: P1, k1, [p5, k1, p1, k1] to last st, p1. Row 3 [WS]: K1, p1, [m5, p1, p5tog, p1] to last st, k1. Row 4 [RS]: P1, k1, [p1, k1, p5, k1] to last st, p1. Row 5 [WS]: K1, p1, [k5, p1, k1, p1] to last st, k1. Row 6 [RS]: As Row 4. Row 7 [WS]: As Row 5. Row 8 [RS]: As Row 4. Row 9 [WS]: K1, p1, [p5tog, p1, m5, p1] to last st, k1. Rows 10 [RS]: As Row 2. Row 11 [WS]: As Row 1. Row 12 [RS]: As Row 2. Worked over 27 sts. Work from written or charted instructions, as you prefer. Row 1 [WS]: K1, (p1, k7) 3 times, p1, k1. Row 2 [RS]: P1, (k1, p7) 3 times, k1, p1. Row 3 [WS]: As Row 1. Row 4 [RS]: As Row 2. Row 5 [WS]: As Row 1. Row 6 [RS]: P1, k1, p7, 1 into 15, (p7, k1) twice, p1. Row 7 [WS]: K1, (p1, k7) twice, p15, k7, p1, k1. Row 8 [RS]: P1, k1, p6, k2tog, k13, ssk, p6, k1, p7, k1, p1. Row 9 [WS]: K1, p1, k7, p1, k6, p15, k6, p1, k1. Row 10 [RS]: P1, k1, p5, k2tog, k13, ssk, p5, k1, p7, k1, p1. Row 11 [WS]: K1, p1, k7, p1, k5, p15, k5, p1, k1. Row 12: P1, k1, p4, k2tog, k13, ssk, p4, k1, p7, k1, p1. Row 13 [WS]: K1, p1, k7, p1, k4, p15, k4, p1, k1. Row 14 [RS]: P1, k1, p3, k2tog, k13, ssk, p3, k1, p7, k1, p1. Row 15 [WS]: K1, p1, k7, p1, k3, p15, k3, p1, k1. Row 16 [RS]: P1, k1, p2, k2tog, k13, ssk, p2, k1, p7, k1, p1. Row 17 [WS]: K1, p1, k7, p1, k2, p15, k2, p1, k1. Row 18 [RS]: P1, k1, p2, (3 into 3 star) 5 times, p2, k1, p7, k1, p1. Row 19 [WS]: As Row 17. Row 20 [RS]: P1, k1, p2, k15, p2, k1, p7, k1, p1. Row 21 [WS]: As Row 17. Row 22 [RS]: P1, k1, p2, (3 into 2 star) twice, 3 into 3 star, (3 into 2 star) twice, p2, k1, p7, k1, p1. Row 23 [WS]: K1, (p1, k7) 3 times, p1, k1. Row 25 [WS]: As Row 23. Row 26 [RS]: As Row 24. Row 27 [WS]: As Row 23. Row 28 [RS]: As Row 24. Row 29 [WS]: As Row 23. Row 30 [RS]: P1, (k1, p7) twice, 1 into 15, p7, k1, p1. Row 31 [WS]: K1, p1, k7, p15, (k7, p1) twice, k1. Row 32 [RS]: P1, k1, p7, k1, p6, k2tog, k13, ssk, p6, k1, p1. Row 33 [WS]: K1, p1, k6, p15, k6, p1, k7, p1, k1. Row 34 [RS]: P1, k1, p7, k1, p5, k2tog, k13, ssk, p5, k1, p1. Row 35 [WS]: K1, p1, k5, p15, k5, p1, k7, p1, k1. Row 36 [RS]: P1, k1, p7, k1, p4, k2tog, k13, ssk, p4, k1, p1. Row 37 [WS]: K1, p1, k4, p15, k4, p1, k7, p1, k1. Row 38 [RS]: P1, k1, p7, k1, p3, k2tog, k13, ssk, p3, k1, p1. Row 39 [WS]: K1, p1, k3, p15, k3, p1, k7, p1, k1. Row 40 [RS]: P1, k1, p7, k1, p2, k2tog, k13, ssk, p2, k1, p1. Row 41 [WS]: K1, p1, k2, p15, k2, p1, k7, p1, k1. Row 42 [RS]: P1, k1, p7, k1, p2, (3 into 3 star) 5 times, p2, k1, p1. Row 43 [WS]: Repeat Row 41. Row 44 [RS]: P1, k1, p7, k1, p2, k15, p2, k1, p1. Row 45 [WS]: As Row 41. Row 46 [RS]: P1, k1, p7, k1, p2, (3 into 2 star) twice, 3 into 3 star, (3 into 2 star) twice, p2, k1, p1. Row 47 [WS]: K1, (p1, k7) 3 times, p1, k1. Row 48 [RS]: P1, (k1, p7) 3 times, k1, p1. Provisionally cast on 41 sts with waste yarn. Row 1 [WS]: Sl 3 wyif, work Cocoon Stitch over next 35 sts, p3. Row 2 [RS]: Sl 3 wyib, work Cocoon Stitch over next 35 sts, k3. Work as set until you have completed 12 full repeats of the Cocoon Stitch pattern. Work Rows 1-11 of a 13th repeat. Slip sts to a spare needle, a stitch holder or scrap yarn. Provisionally cast on 33 sts with waste yarn. Join working yarn. Knit 1 row. Row 1 [WS]: Sl 3 wyif, work Seedpod Pattern over next 27 sts, p3. 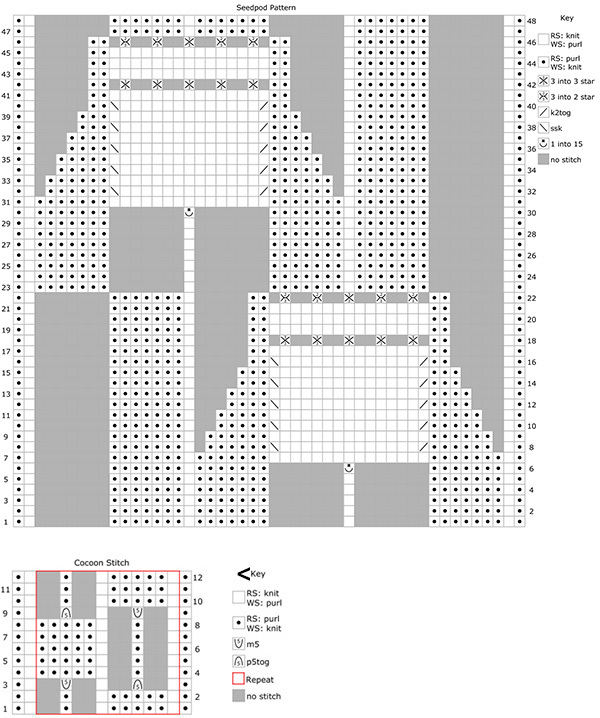 Row 2 [RS]: Sl 3 wyib, work Seedpod Pattern over next 27 sts, k3. Work as set until you have completed 3 full repeats of the Seedpod Pattern. Work Rows 1-47 of a 4th repeat. Meet up with your friend or send a package full of goodies and 1 of your freshly knit cowls by carrier pigeon, boat, owl, or other available mail service. Coordinate so that each of you end up with 1 of Ysolda's design and one of Stephanie's, in different colors. Join the ends of first link as follows: un-do provisional cast on and slip resulting live sts onto needle; if necessary also return live sts from other end to needle. Graft ends together in pattern. Join the ends of the second link in the same way, but before joining pass the end through the first link so that once the second is Kitchener stitched they cannot be un-linked. Do not forget to link them - seriously, Ysolda did it twice and that's a lot of precise Kitchener stitch to have to re-do -- oops! Stephanie Dosen is an American singer living at the foothills of the Rocky Mountains.Â She designs knitwear under the name Tiny Owl Knits and her work has been featured in Inside Crochet, Vogue Knitting, and Interweave Knits.Â She is currently working on a new album, and book of everyday magical knits. Ysolda Teague lives in Edinburgh, Scotland, and became a knitwear designer because one day in 2005 she stumbled across the Knitty submission page and thought "that seems doable". 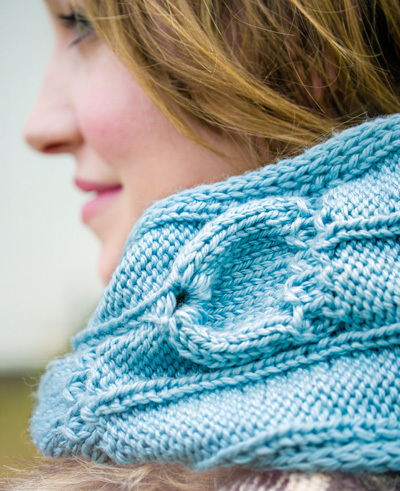 Her first pattern, Arisaig, was published that fall and she had no idea at the time how many knitters were out there or how much it would change her life. Now she designs full time, has self published 5 books and travels the world to get together with other knitters. They're the kind of friends who decide on a whim to get together in Iceland for a photoshoot, without much of a plan, a tight deadline, and a firm belief that everything will work out. Thanks to a whole bunch of other wonderful friends that we never would have met without knitting, it did! Pattern & images © 2012 Stephanie Dosen + Ysolda Teague.